This elaborate sepia watercolour by John Martin appears to illustrate the story of Adonis who was wounded by a wild boar whilst out hunting and bled to death in the arms of his beloved Aphrodite whilst she wept tears of sorrow – his blood mingled with her tears and on touching the ground, created the anemone flower. John Martin created a number of images derived from the tales recounted in Ovid’s Metamorphoses early in his career as an artist. 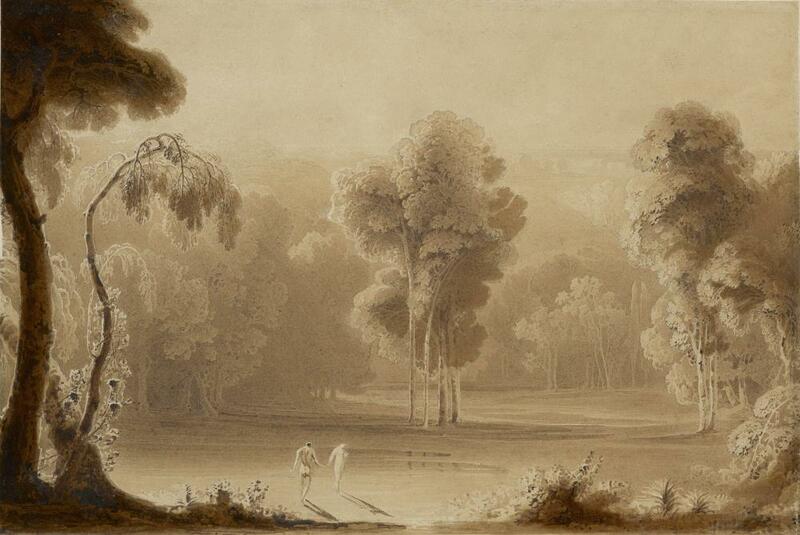 This form of elaborate sepia watercolour, featuring densely worked woodland scenery with classical figures and usually worked on a format of 7 ¾ x 10 ½ inches, is the culmination of Martin’s work in monochrome watercolour washes for the creation of purely romantic landscapes. He produced a number of comparable watercolours around the period 1818-1821 and in view of the similarity of both their handling and content, together with their almost identical size, it is likely that they are all associated with the same group of classical tales. In this watercolour we see the elaborate gnarled oaks which had first begun to appear in Martin’s oil paintings of The Hermit of 1816*1 and The Bard of 1817,*2 in his etching for Characters of Trees (C.W.7) also of 1817, and subsequently throughout the Paradise Lost series in images such as the smaller plate of Eve presenting the forbidden fruit to Adam (C.W.67). In later years, when Martin did return to use the medium of monochrome watercolour, it was almost invariably to paint a design for another engraver to use as the basis for a line engraving upon steel or upon wood. Such engravings were published extensively in the various annuals issued during the 1820’s and 1830’s, and also comprise the entirety of Martin’s contribution towards the fundamentally important publications of Westall and Martin’s Illustrations of the Bible and Illustrations of the New Testament (published 1834-1836). *1. Often known as Edwin and Angelica, the Laing Art Gallery, Newcastle upon Tyne. Two other versions of this painting are known: one unsigned and undated version was sold at Christie’s, London, on 24th of November 2004, lot 5; another larger version of this subject, presumably of similar design, was exhibited at the British Institution in 1843. *2. Laing Art Gallery, Newcastle upon Tyne; another, reduced version of this subject is in the Paul Mellon Collection, Yale. *3. Other comparable sepia watercolours by John Martin and of almost identical size include: Classical warrior defending his family from Wolves (British Museum 1887,0722.2), Classical warrior with his family (British Museum 1887,0722.1), Glaucus and Scylla (1820) (Vassar College Gallery).